StarCraft's Baneling is a sub-species of Zergling that, upon approaching an enemy unit, triggers a violent chemical reaction that causes the sacs on its body to explode, spewing acid. Science fiction meets science fact in Neocapritermes taracua, a species of termite that uses similar sacs to suicide bomb enemies of the colony. Native to the rainforests of French Guiana, Neocapritermes taracua workers spend their entire lives slowly transforming into tiny weapons of relative mass destruction. As the termites age the sacs on their body slowly fill with blue crystals secreted by glands located on their abdomen. By the time the workers are too old to perform standard worker functions, those sacs are filled to the brim with these crystals. Using bodily excretions as a weapon is quite common in the termite world. Some termites shoot feces at their enemies with great distance and accuracy (yum). Others develop an especially thin portion of their abdominal wall that, when tensed, explodes outward, showering their enemies with more feces. Some species have even developed a toxic chemical that mixes with this messy deluge, making them all the more dangerous. Neocapritermes taracua takes this process a step further. The crystal-holding sacs are located near the insect's salivary glands. Being bitten causes the sacs to rupture, the crystals mixing with saliva to produce a toxic blue liquid. It's a little disgusting, but tremendously fascinating. The entire amazing process is detailed in a recent article published in the journal Science. "The sophistication of this is remarkable: we have never seen an external pouch like this before that adds one substance that needs to be mixed with another substance," says Olav Rueppell, an evolutionary biologist from the University of North Carolina Greensboro, who studies social evolution in honeybees. "This kind of adaptation would not evolve in a solitary context; this shows the power of eusociality, and why these insects are so successful." 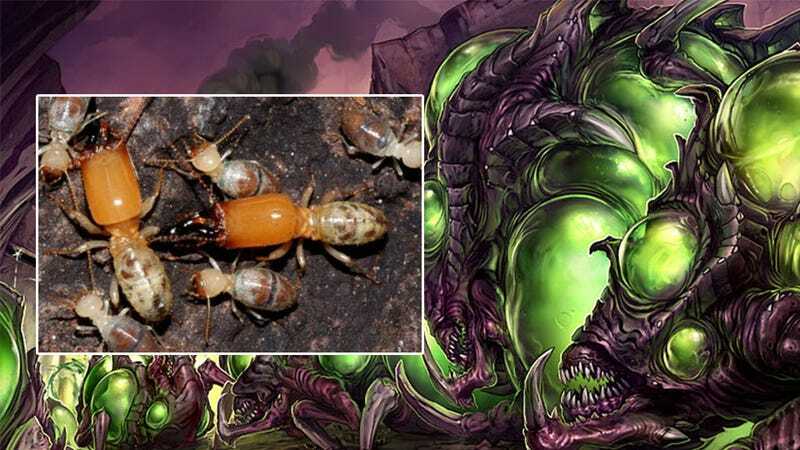 So the next time a Zerg player is spewing acid all over your units remember, at least they aren't exploding termite poo-bombs. Well, not actually.